Dr. Marie Sandrock, deputy director of the Defense Department’s Strategic Capabilities Office, oversees SCO’s mission to develop new and innovative technologies to shape and counter emerging threats across all domains, bringing game-changing capabilities to the Joint Force. As SCO’s deputy director, Dr. Sandrock’s top priority for research and engineering is artificial intelligence and machine learning. In September, ExecutiveGov reported that SCO had identified programs that could use AI to assist military operations. Currently, SCO is capitalized in the field with many autonomous projects in development. SCO Director Chris Shank has said almost a third of the office’s projects cover AI, machine learning or autonomous technology. 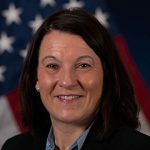 Dr. Marie Sandrock will be featured as a keynote speaker for the Potomac Officers Club’s 5th Annual Defense Research and Development Summit on January 15th. 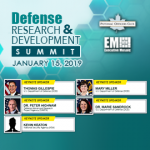 The event will focus on defense R&D plans, priorities, challenges and how the industry is working to make changes and reach other significant milestones.